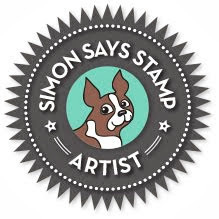 Today marks the beginning of Simon Says Stamp's month long celebration of STAMPtember! They have lots of fun planned for the entire month, starting with a fabulous new product release (including stamps, dies, stencils, watercolor palettes, sequins, cardstock, and envelopes) which can be found HERE. There's also a great TWO DAY blog hop which starts at noon today. Check it out HERE. Here are my absolute favourites from the new release. The first two items you'll see me use over the next two days and the rest of them I just ordered. 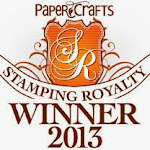 My favourite product from this release is the gorgeous Ornate Background Stamp. *Swoon! 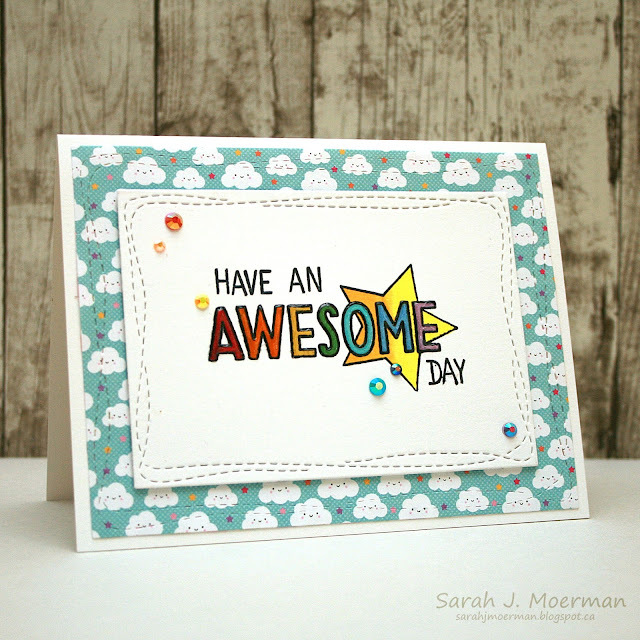 * I used it to make the following card (as well as a card I'll be sharing tomorrow as part of Day 2 of Simon Says Stamp's STAMPtember Blog Hop...so be sure to come back then)! I first stamped the Ornate Background Stamp onto Simon's Green Apple Cardstock with the matching Green Apple Dye Ink for a tone on tone effect. I then stamped the same image onto Neenah 110 LB Cardstock with Memento Tuxedo Black Ink and fussy cut around part of the image. I coloured it with Copic Markers and used a Memento Tuxedo Black Marker along all the cut edges to hide the white. I lined up the coloured image with the tone on tone stamped piece and adhered it in place. The sentiment is from Simon's Thoughtful Messages Stamp Set and was stamped with Verafine Onyx Black Ink. My second card for today was quick and easy to put together thanks to Simon's new Amazing Messages Stamp Set which, while not ornate, still packs a punch. I'm looking forward to using this stamp set to create lots of birthday and encouragement cards for kids (amd again will share another card using this set during tomorrow's blog hop). Once the sentiment pieces were stamped on cardstock cut with one of Simon's Wonky Rectangle Dies, I coloured in the 'AWESOME' and star with Copic Markers. I added some Wink of Stella Clear Marker to the star and covered the 'AWESOME' with Glossy Acccents. I finished things off with some beautiful Lucy Abram's Rainbow Sparkle Jewel Mix. Using Foam Tape, I adhered the stamped panel to a die cut piece of Doodlebug Fairytales 6x6 Patterened Paper I had left over from Simon's September Card Kit. Before I go, I wanted to share the Ornate Background stamped piece my 10 year old daughter coloured. She actually broke open this stamp as soon as we got home from the post office before I go a chance to, lol. I was literally waiting in line to use it! Ha! Anyways, I think she did an amazing job on this and I love the colour combo she came up with. Thanks so much for stopping by and be sure to come back tomorrow! Supplies, with compensated affiliate links at no extra cost to you. * indicates products from STAMPtember. That background stamp is incredible and the first card you did with it is just WOW! I love it! Your daughter did a lovely job coloring it as well. wow those backgrounds! totally blow me away! beautiful work! Wonderful of amazing and unique cards. Good ideas. Wow your cards are super cool. Love this stamp! I'm always looking for ornate images to color. Wow! These make a statement. Lovely! Fantastic, I love the colorful cards! A triple grand slam of gorgeous, colorful cards! I'm in love with that background stamp! These backgrounds are so pretty, really love the green card! 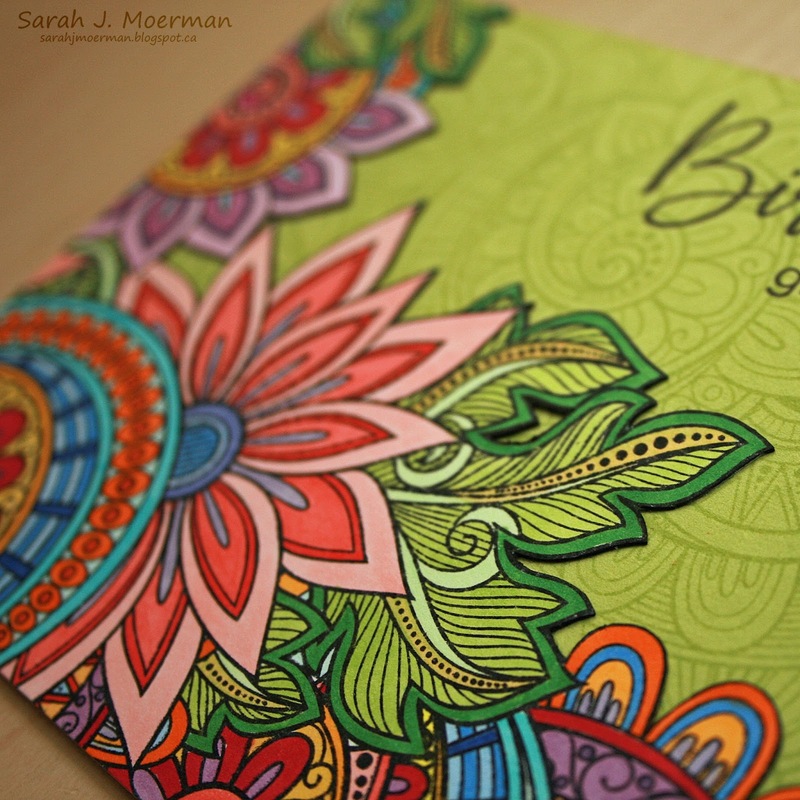 Love the use of the background stamp for such a colorful and beautiful outcome! Just stunning! Love the background stamp and using it on colored card Stock! Such vibrant, beautiful cards. I love how you colored them, thanks for sharing. gorgeous cards-and the first one is especially eye catching-wow!! The two background colored cards are awesome. Beautiful coloring. Lovely coloring on that background stamp. You put in a lot of time..no wonder it looks great! it seems to me that you must be raising another amazing cardmaker! your cards are both lovely and your dear daughter's colouring is stunning! Love how colorful these cards are! These are wonderful cards...love the colors and techniques. Thank you for sharing these. I love the second card using the amazing messages stamp set. I have so much patterned paper and didn't really know how to use it, thanks for the tip! your daughter did an awesome job on that background stamp. Love how you colored just part of it and left the rest tone on tone. so pretty! Wow! Your colouring is amazing - doing those backgrounds much have taken ages, but totally worth it! Fabulous! Love that background stamp! It has been added to my wish list! Love theses, and your daughter did beautifully! Love all of these cards! Such different looks but so nice. That green background really adds to the ornate background. Love the story about your daughter!! LOVE all of these! Amazing! Great cards, I really like how you've used the ornate background stamp. I absolutely love your card.. it's just so beautiful and amazing! Your daughters coloring is also beautiful. She must be very talented too! Love your cards! The colors are just fantastic!! Love the bold colors you used! Makes the images just pop! WOW, WOW, WOW. These cards are truly works of art. Thank you so much for sharing. What a beautiful design on that first card! Your card using the ornate background is stunning. THANKS for the inspiration. That ornate background is gorgeous! And your daughter did a fantastic job! Kudos to her! Stunning works of art with all those beautiful, bold colors. And a rainbow of color always touches my heart. Well, your ornate background card is stunning. I love how you showcased just part of it with color. Your second card is fun and would be great for adults too. But I have to say, your daughter is amazingly artistic! Her rendition of the ornate background is absolutely beautiful. Thanks so much for sharing. I really love your card. I have seen many examples already of what to do with this stamp. I must get this stamp ASAP. It beckons me. Thanks for the great ideas. I like your version of the ornate background stamp. I also like your daughters version. Great coloring from both of you. The encouragement card is neat too. I can't believe how much bright beautiful colouring you've done! Wow! Stunning cards! I love the amazing messages card. That patterned paper is a really cute pairing. Just WOW! You did an amazing job of coloring, and your daughter....she is well on her way to becoming an incredible artist!! As soon as I clicked the link and arrived at your blog and saw the first card, I said WOW. That card is impressive. 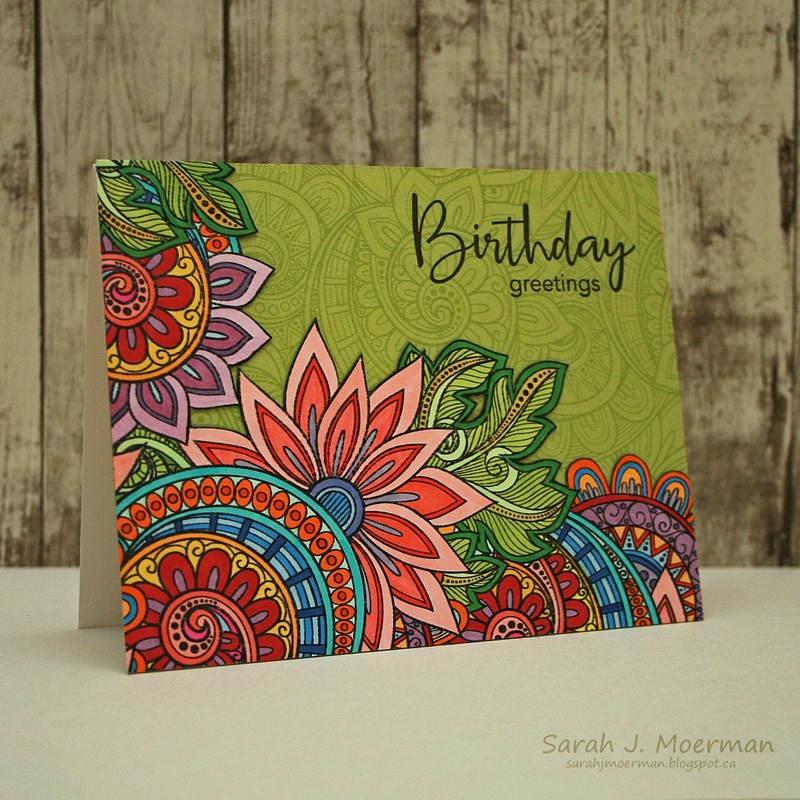 I just love the way you combined the Ornate background stamp as both the background and focal piece in that card. Your daughters coloring using the same stamp is also just gorgeous. Thanks so much Sarah, for the inspiration and sharing with us!! I LOVE your ornate background stamped card!!! Your daughter also did a gorgeous job! I am going to have to have that stamp! Your daughter is a chip off the old block. Wow, her coloring is beautiful. I wish I was a good fussy cutter because your cad would be so fun to try to recreate. I am swooning over it. Love the brilliant colors you and your daughter have used. Love the vibrant colors on the cards! Very boho! Oh So beautiful, if I win I am going to apply my 50.00 to buying a whole set of copics and then I will color that background stamp too!!! Oh my goodness...what an amazing stamp...and what you did with it is even more amazing. So stunning. Beautiful. Beautiful coloring on the great background stamp, your cards are very inspiring! I love the background and the way you colored them, just gorgeous! I was so excited to see these cards. I love the ornate background and the amazing messages set. Your Ornate Bakground cards are absolutely stunning! sing. Beautiful colors and combinations. Love the coloring! Very colorful! One word;WOW. Thank you for sharing your wonderful cards. Such vibrant colors. I love these cards. Looks like alot of coloring but they are all beautiful. i love the tone on tone and the addition of the colored piece. better be careful, your daughter might take over your blog next. :-) great coloring. 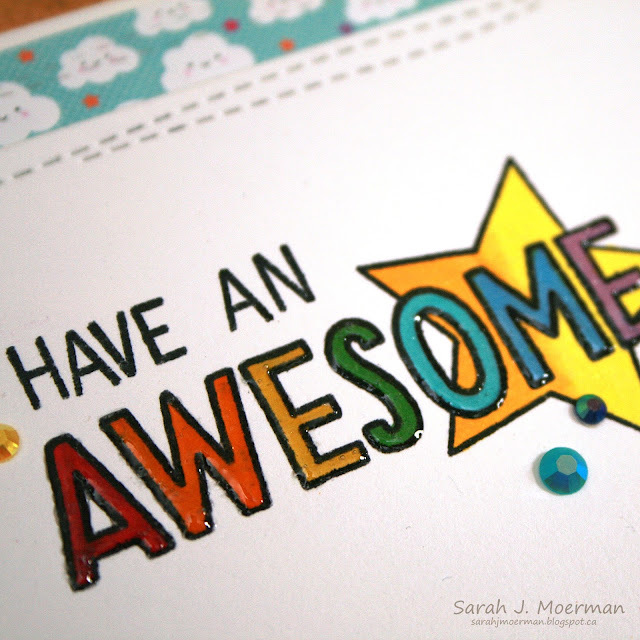 Hello Sarah, i love your colorful cards, great ideas. Thank you. These cards are amazing and your daughter has some mad coloring skills! Obviously the talent runs in the family, your daughter's card is stunning along with yours. 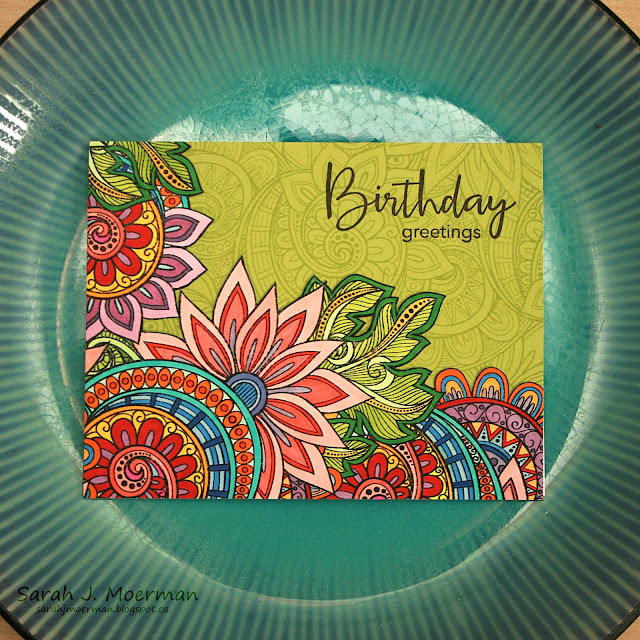 Love your different ways of using the ornate background stamp! Your cards are so beautiful. Love the ornate beackground stamp and you showcased it amazingly. Thanks for all the great inspiration. Your use of such beautiful colors just blows me away. absolutely gorgeous! I want this stamp -- but will you color it for me? Your card with the ornate background stamp is simply breathtaking! What a perfect collection of perfect cards! Thanks for the great inspiration and for fantastic giveaway! Gorgeous cards, Sarah! I really like the idea of tone-on-tone stamping on the green cardstock and then stamping it again on white cardstock and touching the edges with black ink to hide any white edges. Thanks so much for your inspiration. Love these bold and colorful cards!! Wow the apple doesn't fall from the tree! Tell your 10 year old artist I think her coloring is outstanding! Wow! These cards are completely stunning! I love them! I love that you had to wait for your daughter to finish before you could begin. You are both terrific at coloring. LOVE LOVE LOVE!! Your white ink/coloured pencil background is AMAZING!!! Thanks so much for sharing and inspiring! WOW another awesome card with the ornate background stamp. I can't wait for mine to arrive! Beautiful cards, love the vibrant colors!! 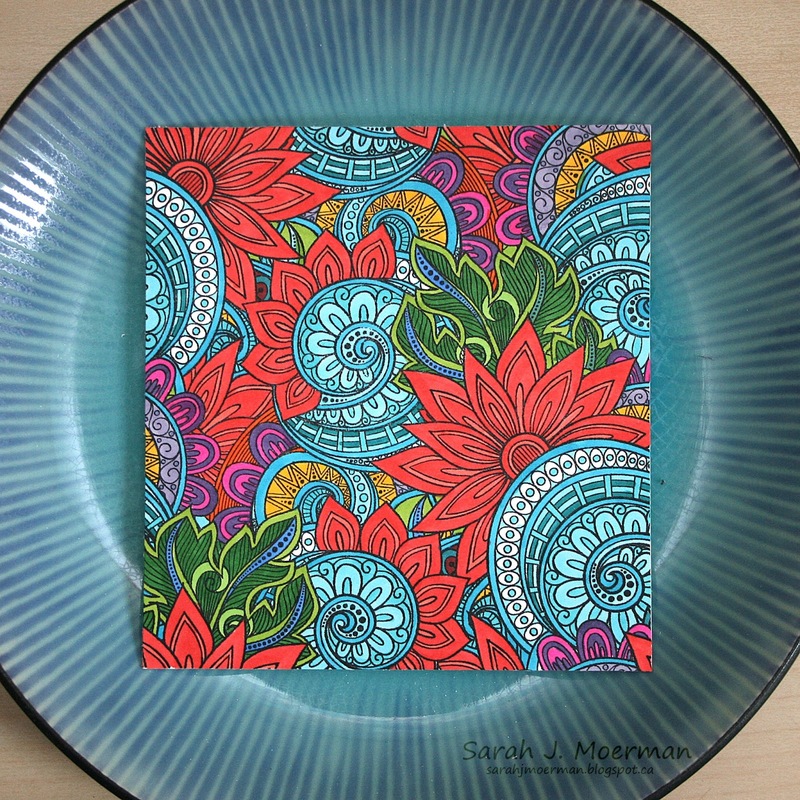 Wow wow wow that ornate background stamp is incredible... can't wait to use it and try these different colouring techniques! Your daughter did a gorgeous job and so did you!! The background stamp is very versatile and one I need!! Your cards are great and so colorful. That background stamp is amazing - so versatile! Stunning creations! Wow, tell your daughter that she did an awesome job! Like her color combo. She's obviously a chip off the 'ole block in terms of artistic talent! I am loving your cards!!! It is stunning!!!! Beautiful cards! Especially love the first card! Two very different but both wonderful cards. I swooned when I saw that first card! TFS. 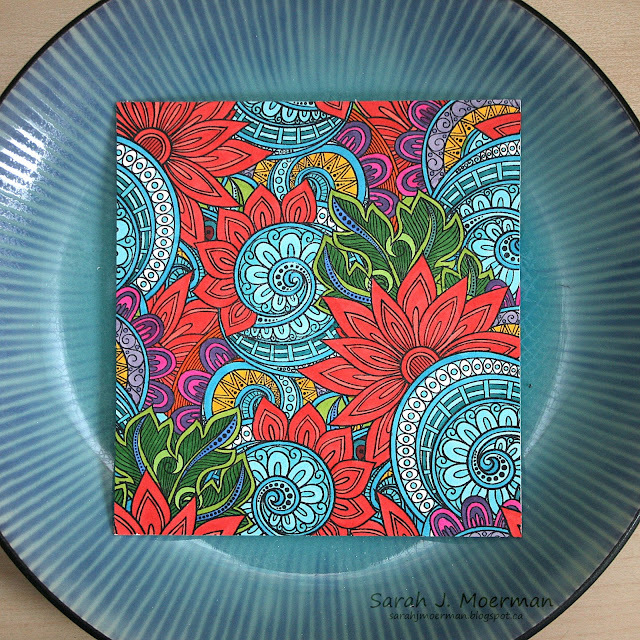 SSS Circles Card Set and October Card Kit Winner!